Headline: Kim Jong Kook refuse to eat deep fried oily food and he prefer a slightly plump and small built (pony) girlfriend. 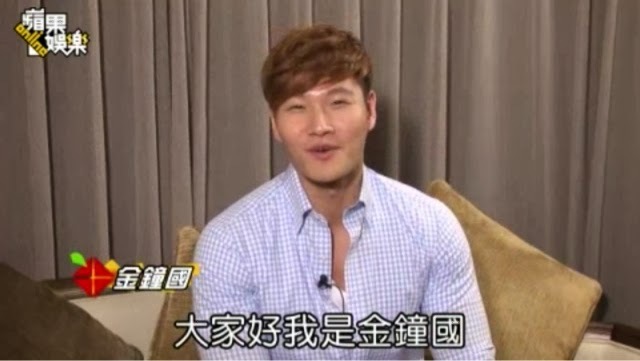 Kim: Hello everyone, I am Kim Jong Kook. Nice to meet you. Who is this muscular man? Introduction: Kim Jong Kook is part of the hosts in a widely popular Korean Variety Programme - Running Man. With his enormous strength, Kim Jong Kook is great in Hide and Seek game and none of his "prey" can escape from him. Therefore, he got the title - Mr Capable. Other than being a singer, the more impressionable part about Kim Jong kook is his muscular body that has only 9% fats. Reporter: You have a fine body. What is your secret formula to keeping fit? Kim: (Blushing) Actually, I don't know as it (keeping fit) has become part of my life. In the past, I used to try very hard to exercise (define my muscles) before showing others. Now it has become part of my life. Before I work, I will do some exercise to maintain my figure, that will be easier. I love to play soccer and do boxing. However, because of my tight working schedule, it is hard for me to find the time. We have to run everywhere during Running Man and the only exercise which I usually do is sit-up. Reporter: what do you look out for in your diet? Kim: I don't like to eat deep fried food and salty food. I don't mind the amount of food intake, I am more particular about the food I take that is good for my health. I will control the amount of calories. Since a long time ago, I like to eat red ginseng and I will eat a bit everyday. In addition, I will eat Vitamin C everyday and eat an apple every morning. Reporter: In order to be like Mr Capable who has a muscular build is not an easy feat. Kim Jong kook at 37 years old is tall, rich and muscular, despite that he is still a bachelor. Is it because he is choosy about his future partner? Kim: It is hard to say about my criteria...however, I like ladies that look slightly plump and healthy. I also prefer girls that is not too tall. Reporter: What is your future plan? Kim: I plan to release an album this year. I would work hard in Running Man and other variety shows too. In addition, I would like to plan more activities to meet my overseas fans.